It’s a strong, lightweight and quickly-installed alternative to a wet screed system. The Knauf Brio 18 & 23 are 18mm and 23mm respectively and can be used without the 10mm wood fibre resilient layer as overlay boards for underfloor heating. With a high thermal conductivity (R = 0.38 W/mK) underfloor heating heating response times are quicker and energy use is reduced. Once installed, Brio creates a robust monolithic floor with a high density of 1100 – 1200 kg/m3, and so reduces impact and airborne sound transmission. Knauf Brio is a high density gypsum based board which helps reduce airborne noise when used within a separating floor. The engineered gypsum flooring panel has 60% recycled content and has been developed for use in new or refurbished residential and commercial buildings. 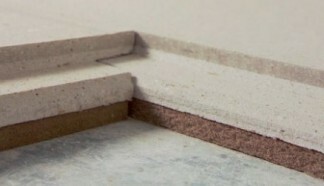 Knauf Brio is also available pre-bonded to a wood fibre layer to reduce impact noise. These boards are referred to as Knauf Brio 18WF and 23WF and are 28mm and 33mm respectively. The Knauf Brio boards are most commonly used in timber frame construction as a floating floor in apartments, hotels and care homes. Knauf Brio 18WF & 23WF offer an excellent acoustic performance with minimum impact on construction heights.